For Liz's 7th birthday her parents had Ginger's Party Ponies come to the house. Ginger bought Cupcake, a fat little pony to give rides on. All dressed in her red cowgirl getup, Liz couldn't get enough of it. On that same birthday her parents bought her a lesson package at Heiland Hills Training Center in Jordan, MN where Liz began her long journey to the horse woman she is today. Fast forward many years later and Liz is an accomplished Event and Dressage rider, with many riding, teaching and coaching achievements. The one that started it all is Lady Hannah B, Liz's first horse. Liz was able to purchase Hannah in 2005 with the help of her parents and grandmother, Betty McGoon. She was Liz's first horse, her very own, no one else's. Liz began competing Hannah in 2005 at Wayne DuPage Horse Trials at the Training Level. They worked hard and moved up to Preliminary in May of 2006 and never looked back. Liz soon had Hannah competing around the country and finished 3rd in the CCI1* at Midsouth in 2007, and moved up to the Intermediate level in 2008. They competed a few CIC2* competitions together before Liz retired her from upper level eventing in 2012 and leased her out to her students. Hannah has really enjoyed showing the younger kids how its done. She truly is a one of a kind horse. Since then Liz has had many rides, but has only purchased two other horses since Hannah. Rhine Maiden aka Lucy, was purchased in 2010 and Liz competed her through Preliminary in 2013 before deciding to pursue the Dressage ranks. As of now, Liz has successfully shown Lucy through the I1 level of Dressage. They are working on 1 tempis, passage and piaffe with the hopes to finish Lucy's training and compete at Grand Prix. 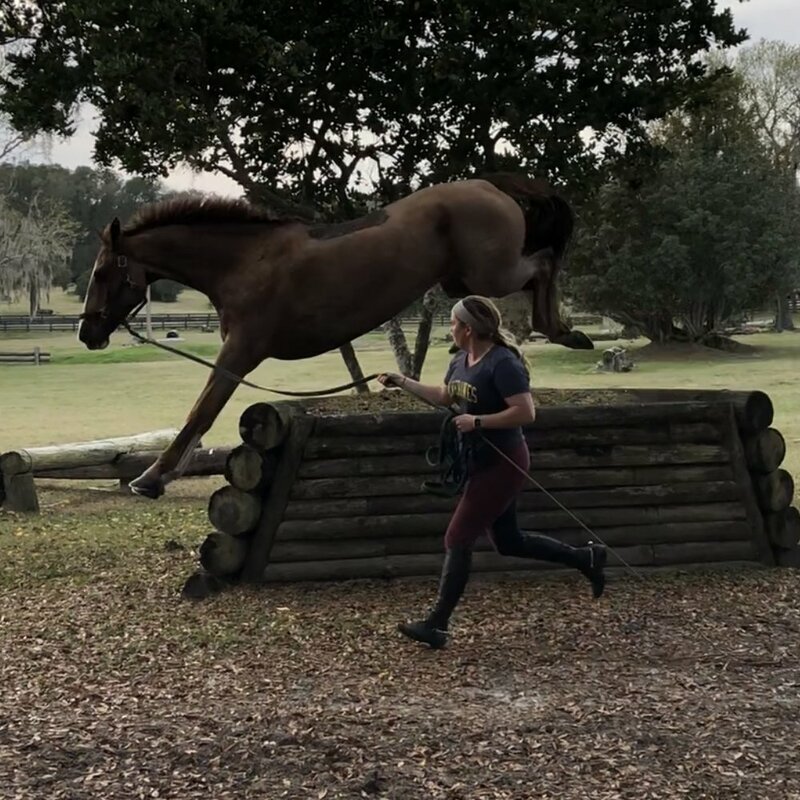 In April of 2014, Liz purchased a 2008 OTTB bay mare to add to her string and has successfully competed her through Preliminary, Flash Mob aka Roxy. In the summer of 2016 both Lucy & Roxy were bred having beautiful colts in 2017. Lucy & Roxy will come back to work in 2018 and continue to compete and train. In November of 2015, Copeland Farms and Liz went off to Ireland. Together they found two lovely geldings that they brought home. Robinstown Balivor, aka Tyson, is a beautiful 17h bay ISH gelding. Liz has competed him through Training level before handing the reins over to Sam Kelly. He is also very talented in dressage scoring in the 70s at First Level. Tyson would make a Young Rider's dreams come true! Privatised, aka Hutchy, is a handsome 17.2h chestnut ISH gelding. He has quickly become the barn favorite and he has some big plans in store. - To create a safe, fun and educational learning environment. -To build integrity, compassion, courage, commitment, appreciation and responsibility as a whole. -To turn out riders that are lifelong learners and that possess the skills, knowledge, a sense of self worth and the ethical values necessary to thrive in, not only an equine lifestyle, but life in general. -To support individuals to be competent, responsible, accountable, passionate riders who consider the horse to be a partner, not a tool. -To work in partnership with riders, their families, veterinarians, farriers, barn owners, and other professional equestrian team members. -To facilitate effective partnerships between horse and rider by bringing together a combination that is safe, sound and well-suited in terms of ability, size, budget and is well-matched to accomplish competitive and personal goals. -To promote sportsmanship and team pride through respect, honesty and hard work as well as through fun, celebration and support of each other. To be a team that earns respect. -To develop riders that are well educated about horsemanship, equine care and responsibilities and to give their horse's needs the utmost attention and diligence. -To maintain the trainer's own education, experience and knowledge in order to support riders with the necessary expertise needed for a successful equine experience. Liz always gets a kick out of the question “why do you need lessons?” Asked by kids’ parents, non-horsey friends and even sometimes educated riders themselves. Liz believes in always learning. Never stop absorbing information and never stop looking for new information. This philosophy has helped shape Liz’s training methods over the years and she accepts that they will continually evolve. One road Liz has always quietly explored is horsemanship. Whatever you want to call it. Liz believes in building a connecting and a bond with a horse to then perform as partners. In the beginning Liz didn’t talk about it much, teach about it much - but as she has grown as an individual she has come to realize just how instrumental this work with the horses have been for her. She now is working on teaching her students so that they too can build strong partnerships with their partners. Another avenue Liz has explored is the United States Eventing Association’s Instructor Certification Program. Liz has successfully been certified as a USEA ICP Level 2 Instructor and is looking forward to continuing her education and her testing over the years. Liz jumping Hutchy on the rope halter. Liz has found it helps build tremendous confidence in the horses when jumping them on the rope halter. She also finds the horses truly enjoy it and look to do more and more. This USEA ICP has helped Liz expand her knowledge and begin to put her own theories into a systematic approach.